Inspired by a vintage piece perched on the concierge's desk in one of the most revered traditional five-star hotels in London, this table lamp is a modern luxury. A royal finish and rich texture make this a tastemaker favorite. I have these lamps in my bedroom and really like them. They put off a good amount of light and have a modern edge to them which is what I was looking for. I would definitely recommend these. 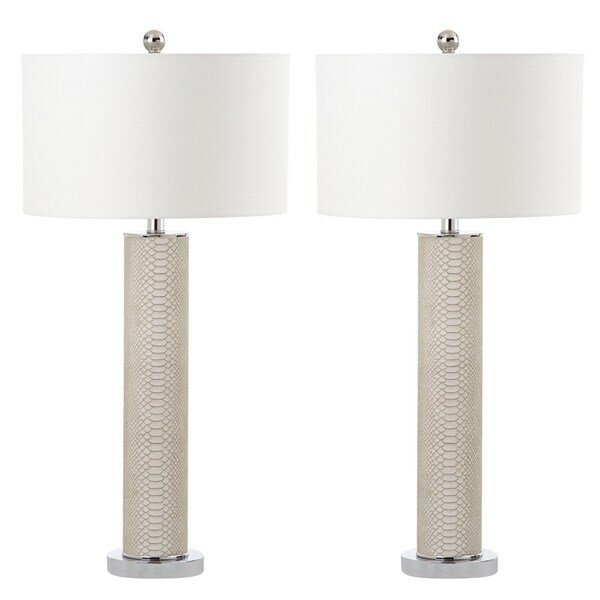 Very nice pair of modern table lamps. Safavieh products always seem to work very nicely in the home or office. I would highly recommend these lamps. Beautiful lamps! You do get two for one price. We liked these lamps so much that although they did not go where we intended- we kept them for our desks. wonderful modern lamps that look like same or crocodile skin but are faux. Add class to any modern room. I never thought I would say I love a lamp but in the words of Brick Tambland (anchorman) I LOVE LAMP!! These lamps are jaw dropping beautiful! I have looked all over and have not found any lamps anywhere as beautiful for the price I paid. I was worried the faux animal skin would look tacky but it is beautiful! The lamps were easy to assemble and I have never had to assemble a lamp before. I am beyond happy with my purchase. I Love these lamps. They are tall and set the tone for a contemporary or transitional home. The white round barrel lamp shades are the perfect size for the base. I love the height of these lamps! My couch sits high and I have cathedral ceilings so they are perfect! The faux snakeskin is really pretty and gives them personality! They are stately lamps! I really like these for the price. The faux snakeskin in not cheesey. It's a good set for the price, however, not the highest end, but neither was the price. I like the design. Very subtle snakeskin pattern, feels like it, but softer. I have them in my bedroom, I really like the height because my bed is high, the scale works, especially when reading. My only complaint is they aren't really secure at the top, one is very wobbly where the lightbulb base meets the lamp top, and it's aways alittle askew, no matter how I try to tighten or fix. The lamps are nice and a good quality, but the color is green/cream. Did not work in my room. I love these lamps they look so sleek and pair perfectly with my bedroom furniture in my guest room. I love that there so tall!! 100% happy with these lamps!! They were easy to assemble and look great with the other furniture in my bedroom. I’ll definitely need to add a few items to make my room look more complete. Nice lamps , wish the silver base was nickel finish instead of chrome finish. these are so pretty with the mix of cream, white, and silver! "Can an incandescent bulb be used instead of the compact fluorescent bulb?" An incandescent bulb can work with this lamp assuming it fits the wattage and screw terminal.